Nearly 400 commodity-based companies have promised to stop harvesting soy, beef, palm, and pulp and paper in ways that drive deforestation, but an analysis of companies tracked by the Forest Trends Supply-Change.org initiative shows that just 35% of them make it possible to track their progress. This must change if real progress is to be achieved. 7 June 2016 | Deconstruct a hamburger, and what have you got? Beef – maybe from Paraguay – on a bun that might contain soy from Brazil and palm oil from Indonesia, all wrapped in a paper bag made from pulverized Malaysian trees. A decade ago, you could have assumed each of these ingredients came at the expense of tropical forests, which were being flattened en masse to make way for giant plantations. That, unfortunately, is still a good bet, but it’s not a sure one, because hundreds of companies have pledged to produce or source palm, timber & pulp, soy, and cattle in ways that don’t drive deforestation. 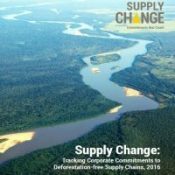 In our newest report, Supply Change: Tracking Corporate Commitments to Deforestation-free Supply Chains, 2016, we have tracked 579 individual commitments from 366 companies – up from 307 commitments from 243 companies in March of last year – and it shows that, of those 366 companies, most still haven’t reported progress on their pledges. Disturbingly, that figure includes companies whose pledges were supposed to be met prior to this year. What’s more, the vast majority of companies active in the beef and soy sectors still haven’t made any pledges at all. We presented our results at the Global Landscapes Forum in London, where investors from around the world are looking to put money into sustainable agriculture initiatives. One glaring finding stands out: disclosure on progress toward commitments is insufficient as public information on progress is only available for one in three commitments. Most of the companies that have committed to reduce deforestation are headquartered in North America and Europe, far away from the commodity-related deforestation. They also tend to be large, publicly traded entities, dealing in food products, and well-known to consumers – but they purchase from smaller, less visible, and less transparent companies. In the report, we look beyond just those that have made commitments, and instead at 566 companies, representing at least US$7.3 trillion in market capitalization, who were identified as having deforestation risk tied to these four commodities. Of companies active in palm, 61% have adopted pledges, compared with only 15% in cattle and 19% in soy. The disparity is alarming because it is estimated that cattle production causes 10 times more deforestation than palm. That’s largely because of the attention given to palm, such as high-profile campaigns against companies like Nestlé and Kellogg’s to reduce forest destruction linked to palm oil. Going forward, the challenge is to shine this same sort of light on soy and beef, while also moving further and further down the supply chain, to the hundreds of thousands of small farmers who supply the bulk of the beef and soy that ends up in burgers and buns. A small but growing number of investors have begun shifting their agricultural holdings from traditional plantations that come at the expense of forests and small landholders to more sustainable activities, many of which earn a return by helping farmers become more efficient, effective, and business-savvy. For most corporations, it’s a completely new way of thinking, and yesterday’s Global Landscapes Forum was designed to move that forward, which is why we chose to launch our report there. Organizations like the Consumer Goods Forum are also moving the ball forward with new tools like the Sustainable Soy Sourcing Guidelines, which help companies develop their own soy sourcing policies. Together, these and other initiatives are bringing the bright light of transparency into a previously opaque part of the global economy – and helping to remove deforestation from the products we use every day. Stephen Donofrio is Senior Advisor to Supply Change, a project of Forest Trends’ Ecosystem Marketplace that enables users to track progress toward private sector commitments to remove deforestation from commodity supply chains. He can be reached at SDonofrio@ecosystemmarketplace.com.